Silent Cycles, out of Chattanooga, TN, builds only with steel, and they had three very different bikes on hand. Above, a cyclocross bike with a very unfinished looking finish that was absolutely beautiful. The frame was left looking very raw, with discoloration of the metal used to give it great depth and character. It’s a thru-axle design front and rear that, despite the rough look, was quite polished in the details. Sleek internal cable and hose routing, fender mounts and a bit of ornate detailing at the head tube and fork crown showed what they could do. Very sleek little cable ports. With smaller steel tubes (and most alloys, for that matter), anything running inside the downtube generally has to pop out to go around the downtube since there’s no room inside the frame to send it directly into the chainstays. Similarly, rear brake cables or hoses that run inside the top tube have to pop out before the seat tube, otherwise they’d interfere with the seatpost. Some builders use integrated seat masts to get around this for more clever routing. Here, Silent kept the housing outside the seatstay, clipping it to the underside to make it all but invisible. Despite having been ridden plenty prior to the show (and getting very dirty many times according to the builder), this finish made it look good as new. Love it. This bakfiets cargo bike was built for the owner of Velo Coffee, who’s developed a new nitrogen charged ice coffee. Similar to Guinness, the nitrogen infusion provides a creamy, frothy finish. That means it’s only available on tap for now, which is what that large box is in the background. It sits inside the frame and lets him deliver deliciously smooth iced coffee. He’s working on getting into restaurants and bars, too, with eventual plans for single serve cans that’ll have a widget inside to create the microscopic bubbles required to create the creamy foam. The steering mechanism uses a rod connecting the steering column to the fork. Flip down kickstand keeps it stable even with a load. The steerer tube is straight and long, running vertically and holding cleanly routed shift and brake cables that split in either direction at the bottom. Side note: These things are incredibly unwieldy. I’ve always wanted to ride one, thinking they were a very cool way to get kids, groceries, etc., and I got my chance on this one. And I almost crashed into more than one booth and person. Someone suggested, as they darted out of my path, that it’s easier to steer when there’s a load on the front, but the massively extended front wheelbase tends to exaggerate every little movement and send the bike off course all too easily. As with anything else, I’m sure it gets much easier with practice, and I still want one! They also had this hardtail, which showed off the paint quality when they do decide to finish a frame properly. Find them at SilentCycles.com or, since their website wasn’t working as of this posting, on Facebook. Next articlePowertap Teases new Products – Crank and Pedal Based Power Meters on the Way? Very nice work, great job of the internal routing. Most common issue with new folks getting on a bakfiet is to look at the front wheel rather than clear ahead of it. Unsure why, but if you look at the front wheel, you automatically start over correcting, making it a show for anybody near by. Loads do help, but avoid the trap of looking at the wheel and you’ll be fine. That all said, nice that they used a larger size front wheel compared to the common 20″. Be great to have one tire/tube combo for both ends of the bike. That ‘unfinished’ finish is now my new favorite. The ‘unfinished’ finish is very steampunk-esque. I’m sure by this summer every hipster will want one (as will this un-hipster). Is there any stable way to get the unfinished look though? So is there a decent way to get this look, but in a manner such that the bike doesn’t degrade. Or at least doesn’t degrade very quickly? Smokestack – good idea, ’cause that’s pretty much what I did: stared at the front wheel. Each little overcorrection only made it worse until I just had to stop abruptly, put my feet down and collect myself. I probably looked about the same as newborn horse first trying to walk. A bakfiets with a 20″ front AND rear wheel can work well. I have 15K miles on my 20″ front/rear bak. Why have a bigger rear wheel when you unlikely to need the really big gears anyways (a 90″ top gear on a cargo bike is enough). And the smaller wheels are much stronger. How is no one talking about the back end/stays/bends on that rigid ss??? any more pictures or details? Please give more details about the ride, weight, etc.? Talking about bent stays, you cant really see it in the photos above but the seat stays on the cross bike are pinched in almost to the spokes then fair back out around the tire. You can see it more in my photo https://www.facebook.com/photo.php?fbid=10204083048056649&l=a8c6350732. He said he likes to use bent small tubes for the seat stays to reduce shock transmission from bumps to the ricer. Justin can do some pretty cool stuff. He repaired an old Lemond steel frame with a torn open dropout with horizontal drop outs. The frame looked awesome. Also, Velo Coffee is some pimp coffee…a Chattanooga product as well. Justin built my CX bike late last year. It’s easily my favorite bike now. So much so that I’m selling my road bike and having him build me another CX bike that I’ll use on the road most of the time. This bike was 18lbs with pedals. Dig the raw. How about a ratrod version? The level of detail and craftsmanship is unreal. Unfortunately I think Bikerumor missed some of the coolest details. The chain stays are 418mm, end up at ~420mm with the chain tensioned, and maintain good tire clearance with 2.35 tires on wide-ish rims. The curved seat stays should create an incredibly comfortable ride as well. There are a lot of cool paint details not shown as well, the finish work is absolutely incredible. 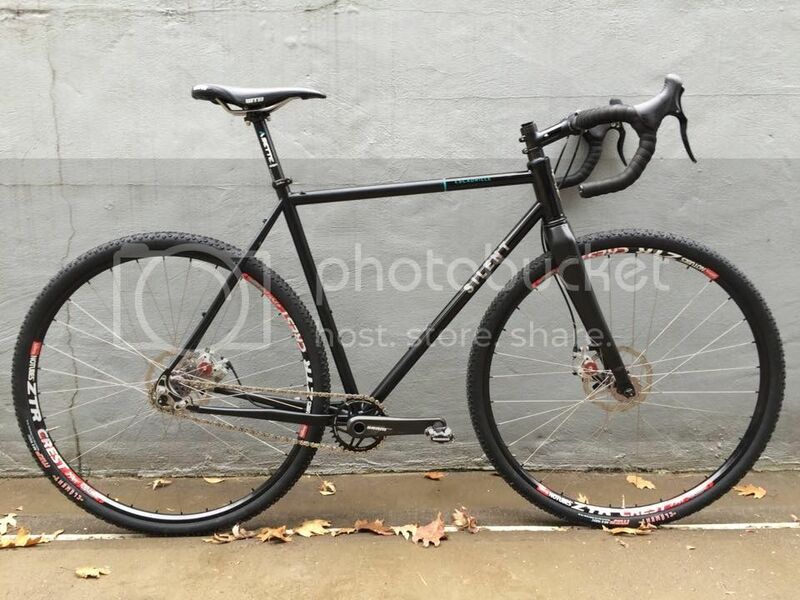 Justin definitely exceeded my expectations and built my dream bike (and then some). If you ever get the chance to talk to him he’s an incredibly nice and talented guy with top notch fabrication skills and a great design sense. nitrous cold coffee!!! that is amazing!